Modems - What are they? What is a modem? How does it work? A modem is a modulator / demodulator (modem) which is a two part system. In any satcom system the reason for broadcasting via satellite is that you want to get information from one part of the world to another. So how do we get lets say our TV picture from our tv camera into the antenna? The transmit path up to the satellite uses a modulator to take the digitised TV camera data and modulate it onto a carrier signal. This is the same process as any radio transmission. Once modulated your data is hitching a ride on the carrier signal, this signal is transmitted to the satellite and back to earth again. At the destination antenna, your signal is then received at a demodulator. The demodulator works just as any radio receiver, the TV data is separated from the carrier signal and this is called demodulated. The data can then be fed into a TV once converted to the appropriate format and watched. This principle is the same for any modulator and demodulator. These two quite separate devices are usually packaged together to make a Modem. They can however, be used on their own, for example, just like your home Satellite TV receiver. This is usually a demodulator only and separates the TV data from the carrier signal for you to watch on your TV. That's a bit of a leap but QPSK stands for Quadrature Phased Shift Keying. if this all get's a bit confusing then don't worry too much as it is covered again in later Tutorials. Keying is a method of communication and is probably a word left over from the old morse code method. There are many modulation techniques of which QPSK is just one. It increases the accuracy of data at higher data rates by having 4 states instead of just on and off. This is acheived by using a sine wave which is phased shifted (delayed) by 90 degrees, 180 degrees and 270 degrees. With 0 degrees being state 1, 90 degrees being state 2 and so on. The diagram above shows 4 ellipses one in each quadrant. These vary in shape with the data that is modulated onto each phase. Four times the amount of data can therefore be transmitted with this technique or four times the accuracy. This is one of the most common forms of modulation. The most useful sounding technique is CDMA or Code Division Multiple Access. This technique spreads the data across a wide area of frequency or a wide bandwidth such that there is very little or no detectable carrier. The signal is said to be down in the noise. The data is coded on transmission and can be recovered from the noise by decoding the signal providing the correct range of frequencies or bandwidth is used. CDMA also allows multiple signals to be stacked upon each other at the same frequency. This then crams in more signals in the same frequency range requiring less space. The system is old but it is only recently being exploited to it's full potential and is being used in everything from the latest mobile phone technology to vehicle telematics applications. Another technique is FDMA, Frequency Division Multiple Access, and is most commonly used with satellites. Quite simply, each access has its own frequency. The power of each carrier is balanced across the whole satellite channel and with DAMA, Demand Assignment Multiple Access, the frequencies of each carrier are controlled by a central control center. Each transmitter is commanded to a frequency by the use of a common control channel. This is implemented in our every day lives through the management of our cellular phone network. We don't notice but our phones are continually changing frequency and power level as we speak. 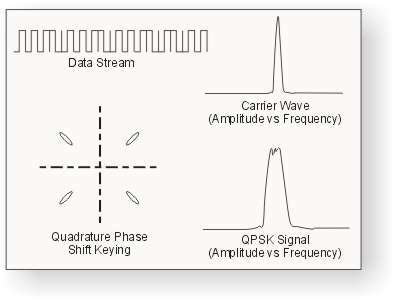 The 8-PSK modulation scheme utilises approx 66% of the bandwidth that QPSK does and therefore can reduce satellite charges by up to 66%. This is an obvious benefit to satellite users but then there is a better scheme. 16-QAM utilises approx 50% of the bandwidth that QPSK does and therefore can reduce satellite charges by up to 50%. There is a catch, these are more advanced modulation schemes than QPSK but require a higher C/No in terms of thermal noise (T) and phase noise (dBc/Hz). This results in an antenna at least twice the diameter of that required for QPSK. If the same size antenna is used then much more power from the satellite is needed and so greater charges will be incurred which will negate the benfits of using the more advanced modulation schemes. DVB-S2 uplink carriers provide the ability to change modulation schemes very rapidly between QPSK, 8QAM and 16QAM and also FEC rates. Each subscriber RX site measures its own downlink signal receive quality, (Eb/No) and reports this information back to the NOC via its return link. If the NOC needs to send data to that RX site it operates using the best modulation and FEC to maximise the data throughput. Poor weather at a RX site requires a lower modulation scheme with more FEC ensure data is received. This is a dynamic and semi-autonomous system of control. Quadrature Phase Shift Keying employs shifting the phase of the carrier plus an encoding technique. QPSK is used in almost all modems. The digital information is encoded using 4 (Quad) level differential PSK. Quadrature Amplitude Modulation refers to QPSK with Amplitude Modulation. Basically, it is a mix of phase modulation and amplitude modulation. QAM phase modulates the carrier and also modulates the amplitude of the carrier. 8-QAM encodes 3 bits of data (23=8) and 16-QAM encodes 4 bits of data (24=16). 16-QAM has 12 phase angles, 4 of which have 2 amplitude values! Higher data rates use much more complex QAM methods. Enough of all that, lets take a step back and look at the anatomy of a satellite communications system otherwise known as a satcom terminal.